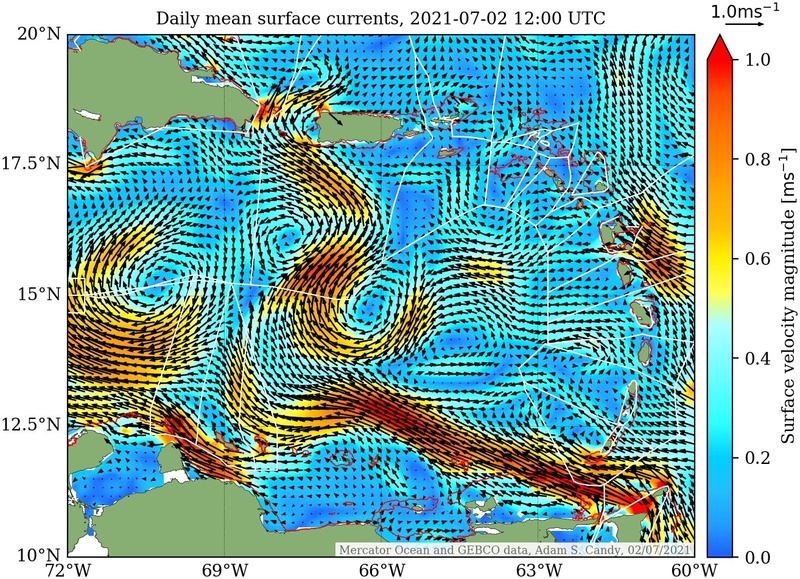 Caribbean watch reports current ocean conditions in the Caribbean Sea, inferred from the Mercator Ocean reanalysis dataset. Separate pages focusing on regions of the Caribbean Sea are linked to below. The regional Caribbean basin result is posted daily to the twitter feed @caribbean_watch. Physical oceanographic conditions in the Caribbean Sea are considered. 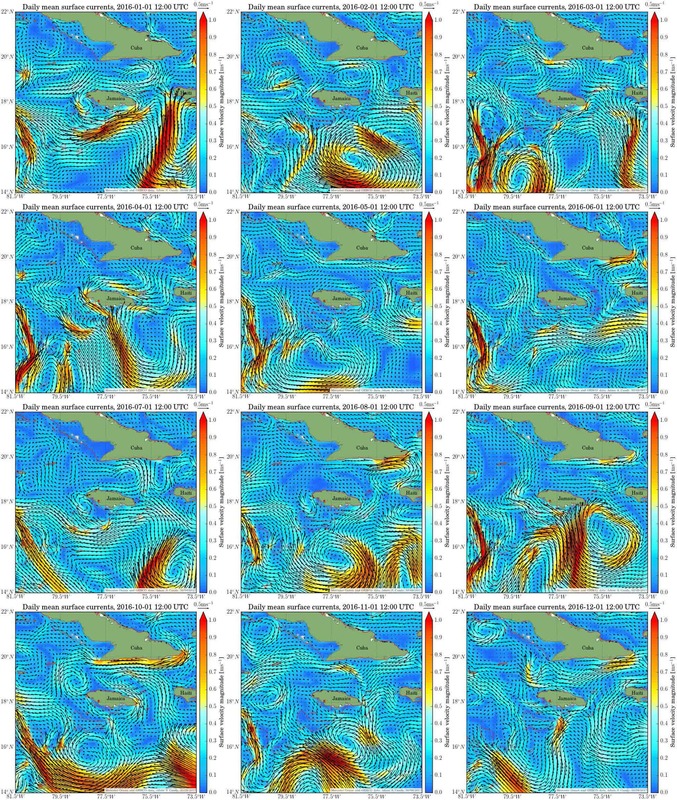 Here we use a combination of data from Mercator Ocean and a state-of-the-art, fine-scale hydrodynamic model of the full Caribbean Sea region using ADCIRC. 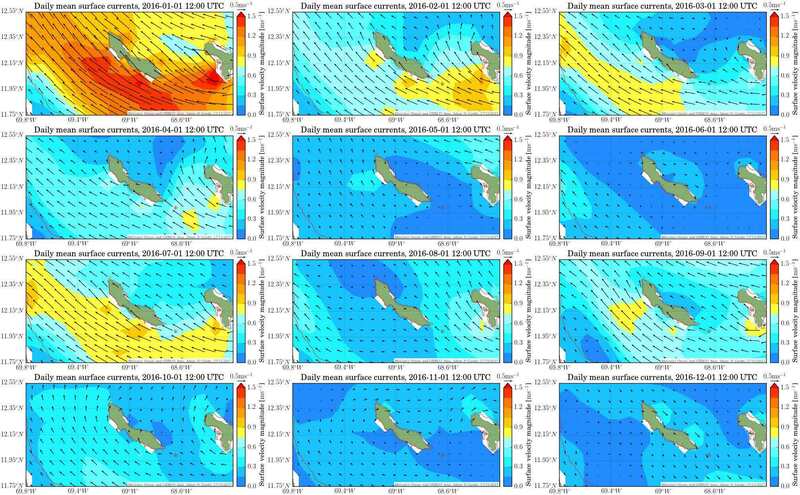 The former is an operational 1/12º global ocean physics and analysis data set. 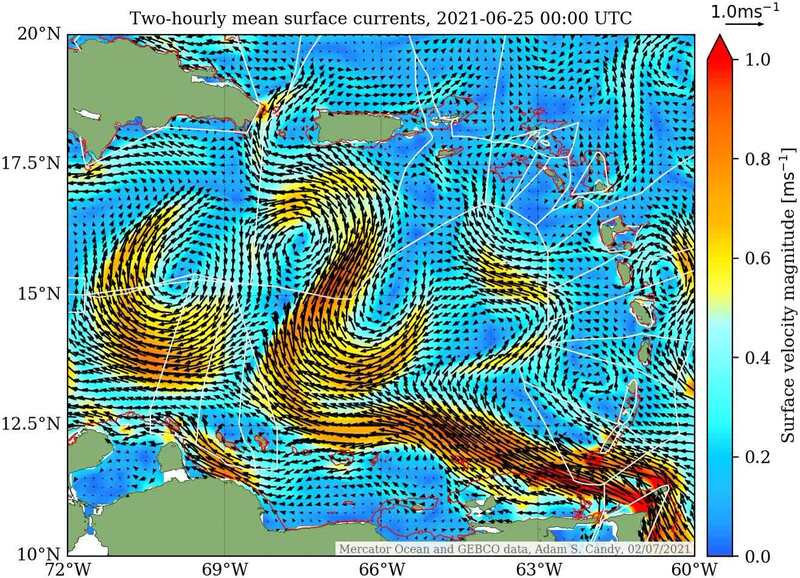 This assimilates data using the NEMO ocean model (version 3.1, at a horizontal spatial resolution of 1/12º, 3-9 km) from various sources, including satellite and shipboard observations, to give the best, continuous approximation of ocean behaviour in space and time, over the period 2007-2017. 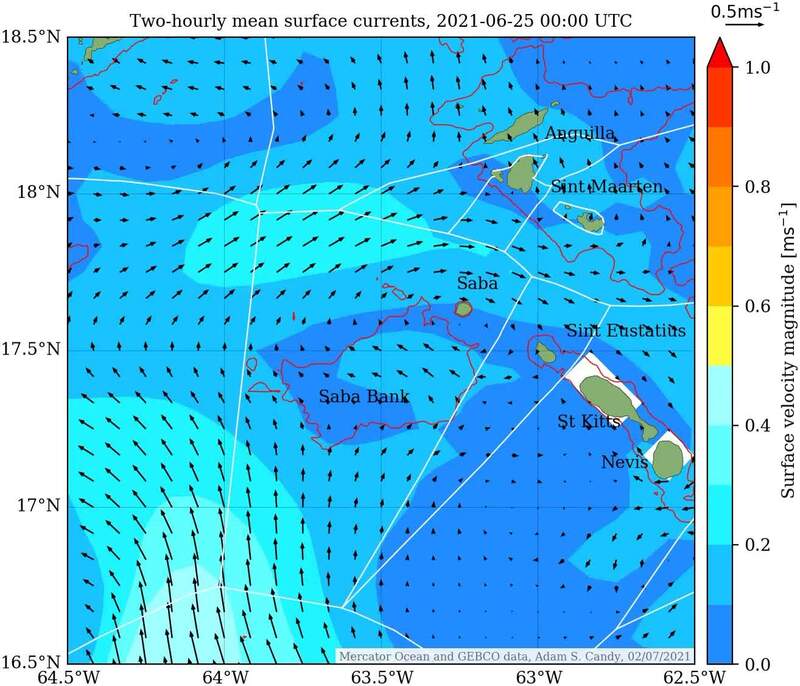 Up to date two-hourly mean surface currents of the regional Caribbean Sea, either side of today 26 Apr 2019: from a week ago on 19 Apr 2019 and forecast nine days ahead to 5 May 2019. 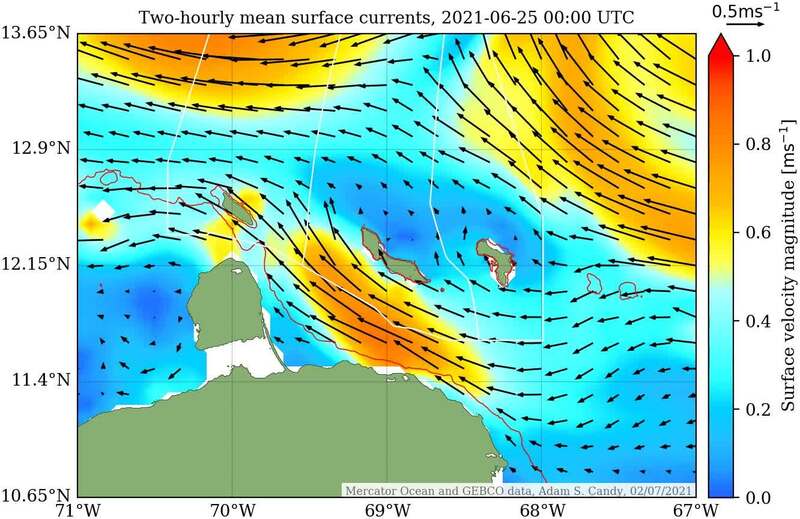 Two-hourly mean surface currents of the Caribbean Sea. 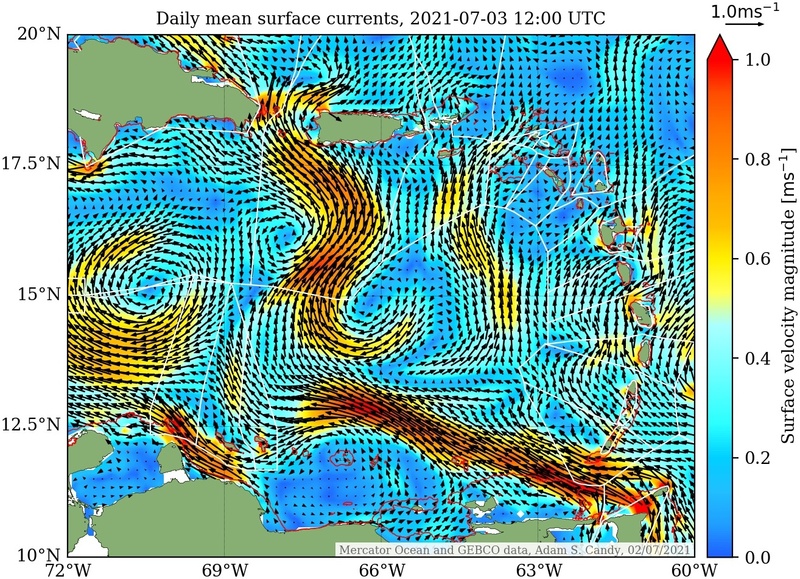 Velocity data is from the Mercator operational 1/12º global ocean physics and analysis data set (Mercator Ocean, 2017). Bathymetry and coastlines determined from GEBCO (2014). To identify the location of shallower waters, a red line marks the 100m depth contour. Bounds indicating Exclusive Economic Zone (EEZ) territorial waters from the World-EEZ-v9-20161021 database. Available to download here. 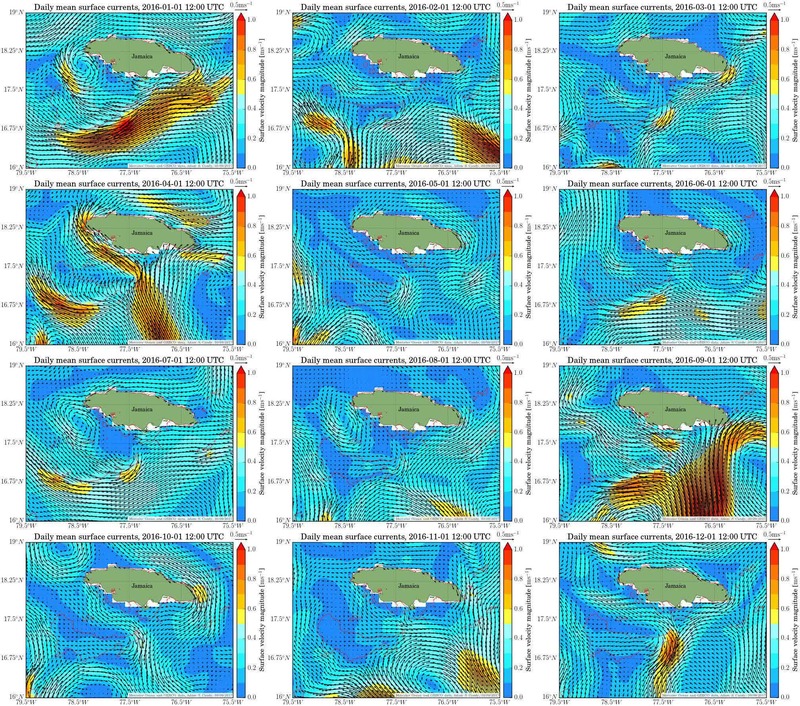 A forecast of the daily mean surface velocity is also available here. Single snapshots (~500KB) also available for today and tomorrow. Up to date two-hourly mean sea surface height of the regional Caribbean Sea, either side of today 26 Apr 2019: from a week ago on 19 Apr 2019 and forecast nine days ahead to 5 May 2019. 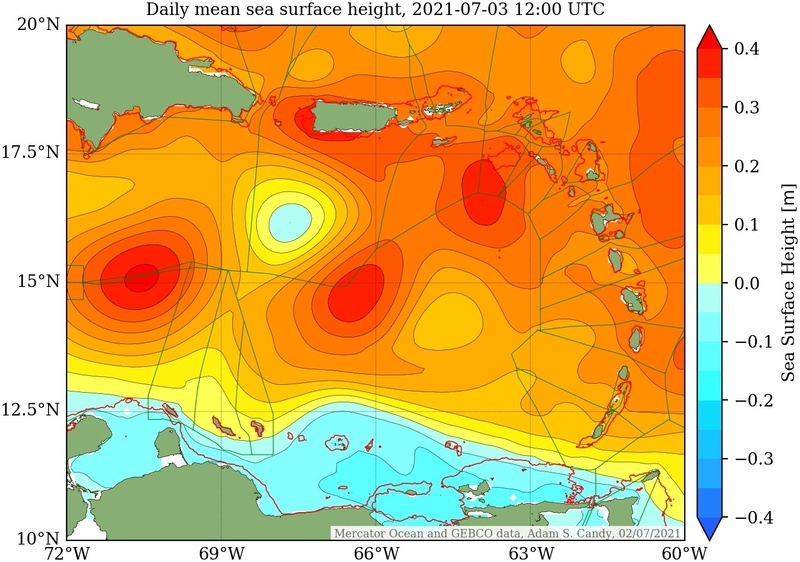 Two-hourly mean sea surface height (SSH) of the Caribbean Sea. SSH data is from the Mercator operational 1/12º global ocean physics and analysis data set (Mercator Ocean, 2017). Bathymetry and coastlines determined from GEBCO (2014). To identify the location of shallower waters, a red line marks the 100m depth contour. Bounds indicating Exclusive Economic Zone (EEZ) territorial waters from the World-EEZ-v9-20161021 database. Available to download here. A forecast of the daily mean SSH is also available here. Single snapshots (~500KB) also available for today and tomorrow. 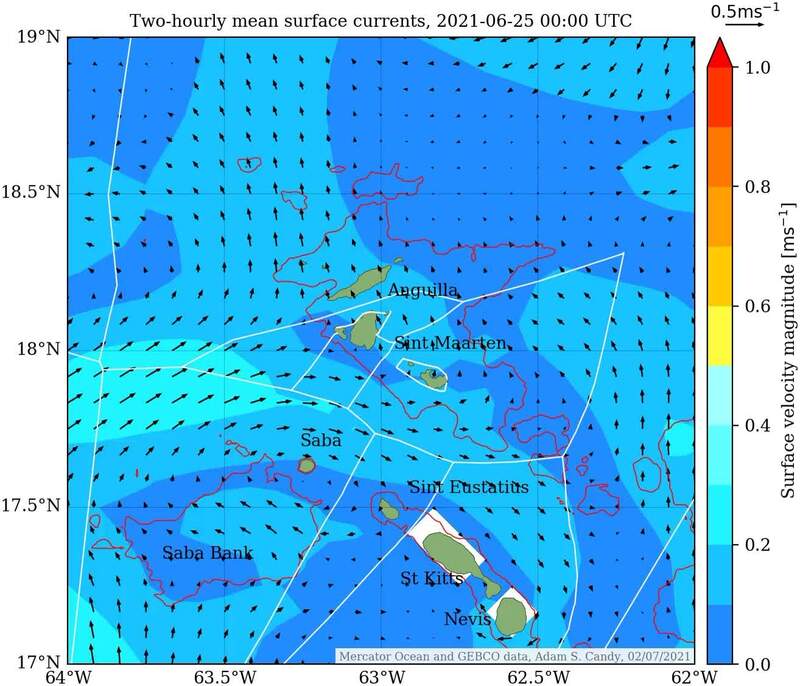 Further analysis for regions of the Caribbean Sea, including daily-updated current conditions and longer-term annual datasets. Conditions in Curaçao this week, and longer term reviews. Follow the link for more details. Conditions in Sababank this week, and longer term reviews. Follow the link for more details. Conditions in Jamaica over the past year 2017 and 2016. Follow the link for more details. Conditions in Sint Maarten this week, and longer term reviews. Follow the link for more details.